The phenomenon has been dubbed 'Star-Gate' — as the world's top scientists and the military lined up to admit they were baffled. Theories ranging from a misfired Russian missile, meteor fireball, never-before-seen type of northern light, 'black hole' and even alien activity were all proposed. Witnesses across Norway, who first glimpsed the space show at 8.45am, all described seeing a spinning 'Catherine wheel-style' spiral of white light, centred around a bright moon-like star. A blue "streaming tail" appeared to anchor the spiral to earth, before the light "exploded" into a rotating ring of white fire. The spiral spectacle — which lasted for two minutes — was seen by vast swathes of the Scandinavian country's almost five million population, with sightings as far north as Finnmark to Trondelag in the south. Totto Eriksen, from Tromso, in northern Norway, was one of the thousands who bombarded Norwegian newspapers with sightings — after nearly crashing his car on spotting the spiral overhead. He said: "I was driving my daughter to school when this light spun and exploded in the sky. "We saw it from the Inner Harbour in Tromso. It looked like a rocket that spun around and around - and then went diagonally across the heavens. "It looked like the moon was coming over the mountain - but then turned into something totally different. "People just stopped and stared on the pier - it was like something from a Hollywood movie." Axel Berg, from Alta, also in the north of the country, added: "It was like a giant spiral - a shooting star that spun around and around. "I initially thought it was a projector but then the 'tail light' left and the spiral remained spinning still." 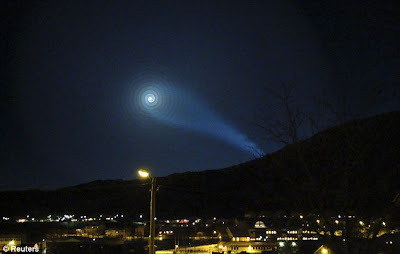 Norway's most celebrated astronomer, Knut Jorgen Roed Odegaard, said he had never seen anything like the spiral before. It really is a new phenomenon among us. In my mind all this has everything to do with black hole and the date 21/12/2012. I'm from Brazil and I'm enjoying the site. 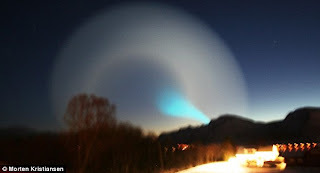 usa media says this is another exsample of russas testing there missiles and this is the affect. why does media have to lie. are we realy not ready for the future. EARTH IS PROTECTING HERSELF FROM IN AND OUTSIDE SOURCES THAT ARE ATTACTING HER. SHE HAS A PERSONEL AGENDA TO INSTINCTIVLY FOR HER SERVIVAL. SHE NEEDS HELP FROM ALL. BE A SMALLER PART OF A BIGGER THING TRY ''KINETICS AND ITS POTENTIAL ENERGY'' LOOK IT UP AND GIVE IT YOUR BEST SHOT ITS SO VERY EASY. A channeled message to humanity about the "UFO-spiral"
A very interesting group and inspiring channeling from a civilization explaining the spiral, saying they are behind it!